As part of our BloggersIdeas interview series, today we have Rajesh Namase who is extremely obsessed with learning everything there is to know about successfully marketing your website online. Also he is Online marketer, Affiliate Marketer and proud blogger. He will be answering various questions related to Social Media, SEO & other Internet Marketing stuffs . So lets start with the interview. First of all thanks a lot for accepting my interview proposal. I and my readers are very pretty glad to have you. Please tell us about yourself and your educational background. My pleasure Jitendra. I'm Rajesh Namase, an IT engineer by education and full time blogger & SEO by profession. I completed my graduation in June 2012 and then I joined Tata Consultancy Services IT company. Within 2 months I decided to quit this job and start full time blogging and affiliate marketing. Vedant Kumar inspired me to start affiliate marketing, so thanks to him. Short answer yes, it will still remain competitive to paid search marketing. Long answer: People talk a lot about Panda, Penguin and Hummingbird but what I found is that the basics of SEO are same; white and some gray hat techniques are still working well for me. Backlinks will play a major role in future as well. How to increase your Facebook shared post reach to your audience? Any ideas. Facebook has changed their EdgeRank algorithm recently, and except top brands it's very hard to get more reach. Truth is Facebook wants us to use their advertising program to promote our stuff. What is call tracking in SEO, why it is important ? Please give examples. If you don't know anything about technology and still want to launch an online service platform then you've two options: Find a partner who has knowledge about technology. Partnership is a good option when you lack something and your partner is good at that. Second option is that you can take a risk and hire people to do your tasks, but this takes money and you should always keep a backup plan handy. Good question, many people fail to write a good pitch about their product. Whenever you're sending an email to large companies keep it short, they don't have time to read your whole email. Make subject line clear and eye catchy. Then in 2-3 lines explain how your product can help people and what are the unique qualities about your product. Which SEO tools you're using, tiered linking still work? If you're newbie in affiliate marketing then I don't recommend these tools because these tools' cost is high. Also you need proxies and VPS to run these tools. Yeah, tiered linking still works but again it totally depends on your strategy. Don't play with it if you don't have experience or know how to do it. Otherwise you'll ruin your money site. If you build your site with WordPress what plugins should you install? Google Analytics for WordPress => Google Analytics (GA) offer too many things, this plugin helps you to get more advatanges from GA and setup is very easy. Akismet or Growmap Anti Spambot Plugin (GASP) => To protect sites from SPAMs. Jetpack by WordPress.com => It offers a hell lot of features. WP Social SEO Pro => Premium plugin to optimize sites for social media. What email management tool should you use? I use Aweber for list building. It is one of the best autoresponder. Still, Aweber's cost is a bit high so you can use Mailchimp or MadMimi if you want. If you're looking for the cheapest but good option then Sendy.co is for you. To create landing pages LeadPages is best option. How do you improve your email subscription rates? How to entice readers so they sign up our subscription newsletters ? Are there any LinkedIn Tools that can help? Please tell us about it. LinkedIn is a network of professional people, I'm using their Android app to connect with them. It's very easy to reply to important messages immediately from mobile. I read his blog techlila, It's fill with great info for bloggers. He is a great guy and have great knowledge. This interview is great and given more helpful inforamtion that we required. Thank you for this great resource and great email marketing tool Sendy. It seems great, I will try it. It is a another inspirational interview, First time to hear about Rajesh Namase. Thank you so much Jitendra, It is really helpful article. Thanks a lot for this wonderful interview here with Rajesh Namase, i really got exposed here with some tools. I’ve read about you a lot. I follow your blog. Thank u for sharing awesome stuff. I ve my site I ve been blogging from past 4 months but I ve failed to produce any results …even my adsense is not approved I don’t know a single thing about affiliate marketing does it help in generating thick revenue ? Thanks for bringing Rajesh and taking his interview. He is really an inspiring blogger. We can learn a lot from the interviews of pro bloggers. I wish to see some other elite Indian blogger’s interview in this blog. Thanks a lot Jitendra. Really motivational interview. I often check his website and here I found some backhead points. Thanks for providing such informative interview. 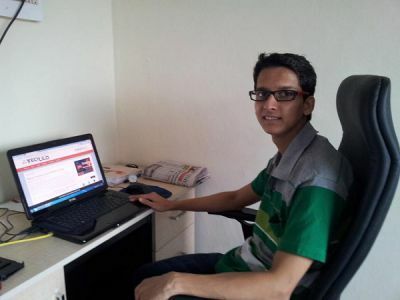 Trully, Rajesh is inspiration for us to pursue our blogging career.